A maximum of ten (10) defensive players will be allowed on the field with a maximum of six (6) in the dirt prior to the ball being hit. Pitchers must wear a protective face mask and chest (heart) guard. Prior to Spring Break and in the fall season when playing other Brookwood teams, there will be a 3 walk per inning limit. After the player pitcher has walked her third batter of the inning, the coach pitcher rules will apply. When a player pitcher has pitched a fourth ball to the batter, a coach pitcher from the offensive team will enter the game to pitch to the current batter. The coach will be allowed two (2) pitches to the batter. If the batter fouls the second pitch, she will be given one additional pitch but the third pitch must be put in play. If on the second pitch, the batter hits a foul tip that is caught by the catcher, she will be declared out. The strike count on the batter will be carried over to the coach pitcher. For example, if the batter has accumulated 2 strikes from the player pitcher, these strikes will carry over to the coach pitcher. If on the first pitch by the coach the batter swings and misses, she will be called out on strikes. The coach pitcher must pitch from the rubber that the player pitcher is pitching from. If the ball is hit, the coach pitcher must exit the playing field so as not to obstruct the defense or the umpire. If the pitching coach is struck by a batted ball, the ball is dead, and the batter must bat again. This will count as a “no pitch” unless deemed by the umpire as intentional (Failure to move promptly after one warning from the umpire could result in an out). 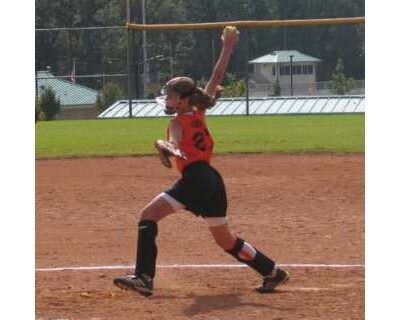 The coach pitcher must simulate a "fast pitch". In other words, the pitch from the coach should be flat - without an arc on it. If in the umpires' opinion the coach pitch has too much of an arc, the coach will be warned and asked to flatten the pitch out. The umpire may issue up to two (2) warnings with no penalty. After the second warning any pitches determined to have too much of an arc will be ruled by the umpire to be "illegal" and cannot be hit by the batter. A pitch ruled as "illegal" by the umpire will count against the coach's pitch allotment. If a batter hits a pitch deemed "illegal", she will be asked to return to the plate and complete her at bat assuming the coach has another pitch remaining. All base runners will also be returned to the base they were on prior to the "illegal" pitch being thrown. There will be no bunting or stealing allowed while the coach pitcher is in the game. If a batter is hit by a pitch (HBP) thrown by player pitcher, she will be awarded first base. However, if the player is HBP thrown by the coach pitcher, she will NOT be awarded first and the pitch will count against the coach’s allotment of pitches. Stealing home is allowed except when the coach pitcher is in the game. A batter may not run on a dropped third strike. All other runners may advance as the ball is still considered live. Only one base may be stolen by each base runner per pitch. The running attempting a steal may not advance to the next base on an overthrow by the catcher. The 4th outfielder must begin each pitch on the outfield grass. During coach pitch, the base runners may take a lead on the release of the ball, but cannot steal. A fake bunt followed by a full swing is NOT allowed at this age group. A batter can fake a bunt but cannot pull the bat back and take a swing at the ball. If a batter performs this act, she will be declared out. Slap bunting/hitting is allowed as long as the batter does not first show a bunt. A courtesy runner may be requested for the pitcher or catcher. If requested, the courtesy runner will be the player who recorded the last batted out. If in the first inning, the courtesy runner is the last batter in the batting order. In subsequent innings, the courtesy runner is the last batted out that is not on base. If the player who made the last batted out is on base, the courtesy would then be the next previous player having made a batted out. No coaches in the field during defensive play.